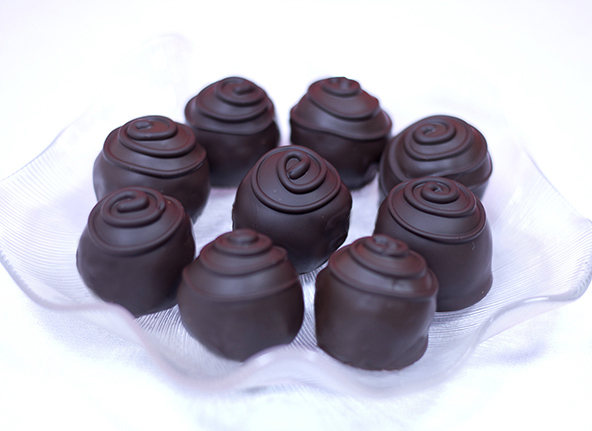 These scrumptious Bon Bons are made with whole ingredients and you would never know it. A very special treat perfect for the holidays or any party. This recipe works well using date sugar which is a preferred whole sugar that doesn’t work in all recipes. I’m also impressed with Barbara’s brand of brown rice crisps. Here is the ingredient list. Organic Whole Grain Brown Rice, Organic Fruit Juice Concentrate (Pear or Apple), Sea Salt. That’s it. Melt peanut butter and coconut butter in a saucepan on low heat, just warm enough to melt the coconut butter and mix them together well. Remove from heat and add mixture to a large mixing bowl. Add the raw honey and date sugar and mix together with a spoon. Add the brown rice crisp cereal and mix together. Chill the mixture for an hour or so in the refrigerator to stiffen up before forming into balls. If you need to chill it over-night, wrap in plastic or in an air tight container. It will be too hard to form into balls so leave it out on the counter until it is the right consistency to form into balls. 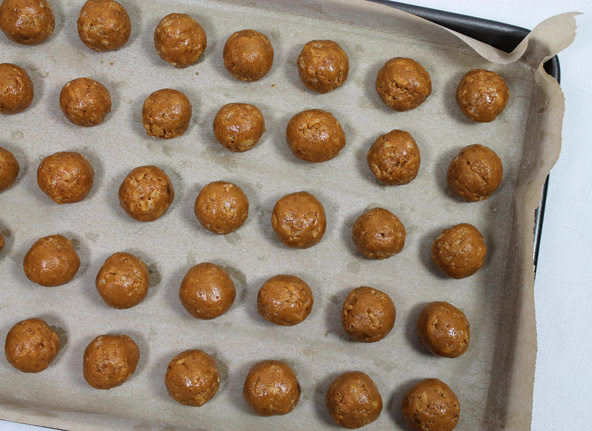 Once formed into balls, they need to chill in the refrigerator or freezer until firm and ready to dip. Having them cold when dipping will help the chocolate dipping process work better. Slowly melt chocolate chips and coconut oil in a double boiler or chocolate melting pot or use the raw dipping chocolate recipe. Dip ball into chocolate, and spoon chocolate over it, lift out with a fork or dipping utensil and tap the side of the pan to release excess chocolate and place on parchment paper to set. Dipping utensils keep less chocolate from pooling at the bottom of the Bon Bon. I put some chocolate into a frosting bag with a small round tip to make the swirl on top. It is easier to use a food grade squeeze bottle though. Refrigerate until firm. They may also be stored frozen. Be sure to keep them away from warm temperatures. 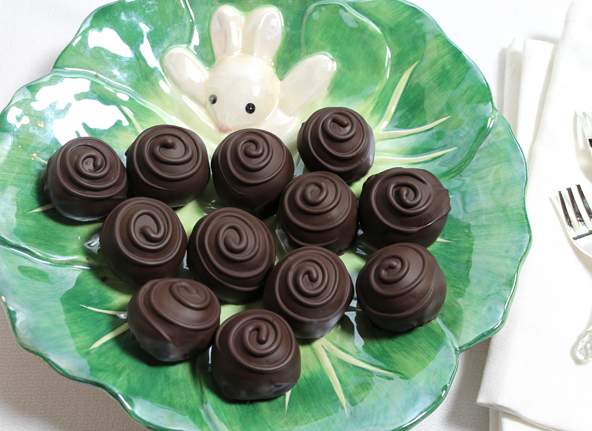 These Bon Bons are great for any Holiday party.